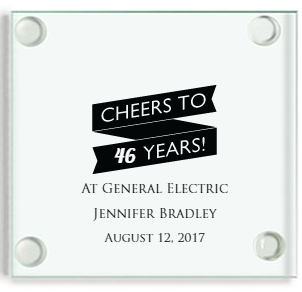 Our affordable and unique retirement drink coasters are a lasting memory of a very important milestone in life. This is are square glass coaster measuring 3.5" and has non slip rubber feet underneath. 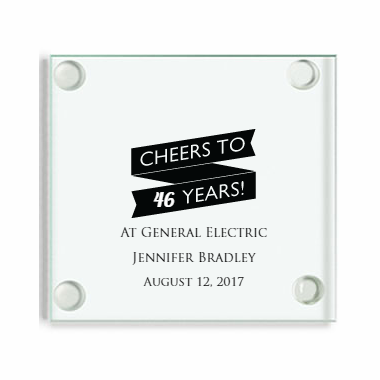 Your design selections are silkscreened directly onto the glass. The coasters are not shipped in individual boxes; they come bulk packed. Most customers put one at each place setting or display them on a table for each guest to take. You can order white gift boxes for $.50 each. They will come flat and you can assemble to insert a single coaster and complete the presentation with a white peel and stick bow.